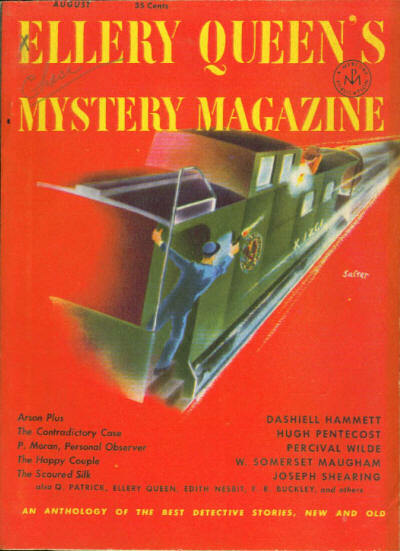 Originally the radio broadcast “Captain Kidd’s Bedroom, (February 11, 1940), this was adapted to the short story format in the August 1951 issue of Ellery Queen’s Mystery Magazine. Again, Ellery strays from New York City and encounters a mystery involving a historic figure and buried treasure. Ellery figures out an old clue, and catches contemporary criminals. The tough part for the cousins in writing this last installment in the Calendar of Crime must have been finding a suitable holiday in a month with no holidays (unless you count Bennington Battle Day, but few do). Instead, they just briefly mention that the tale takes place in August. They wrote this story to fill out their upcoming collection, and hokey as the tale may be, it appeared in Ellery Queen’s Mystery Magazine, so they were free to flesh out the story and the characters a little bit more than in their slew of stories in This Week. If anything, this shows how limiting the stories must have been to them, despite the huge numbers of readers, I can imagine their frustration at having to create a whole world in just a few words.